It is always recommended that you change your passwords to social media websites including Facebook as often as every 3 months even. 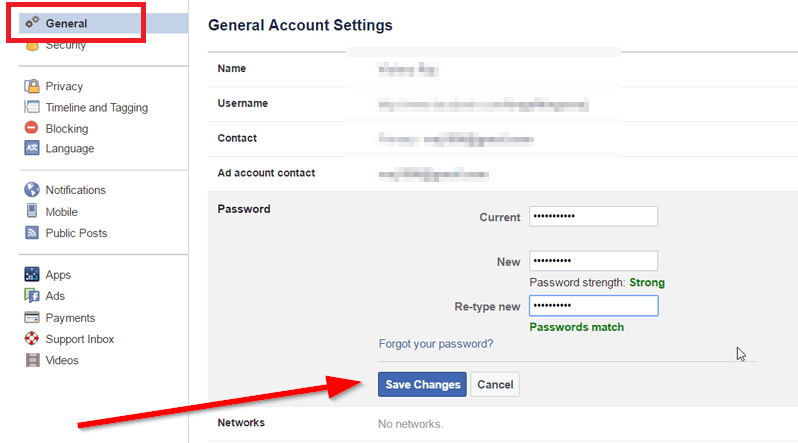 This post will explain how to change your password to Facebook in a simple to follows steps along with screenshots. Obviously, first have a new password at hand before proceeding. You can create a strong password by including lowercase, uppercase alphabets, digits, symbols etc. This will make it tougher for someone trying to hack into your account. If you already know your old password, go to Facebook.com, and log in after giving your current credentials i.e., your username and password. Once logged in, go to your account settings by clicking on the small downward arrow at the top right corner. Clicking this arrow will open a host of settings and options. Click on “account settings”. You will now be taken to the general account settings page, here you will find options to change everything about your Facebook account. Click on the edit option next to the row names, “Passwords”. Facebook will ask you to give your current password and the new password. Enter these and click on “Save Changes”. That’s all there is, you have successfully changed your Facebook account password.